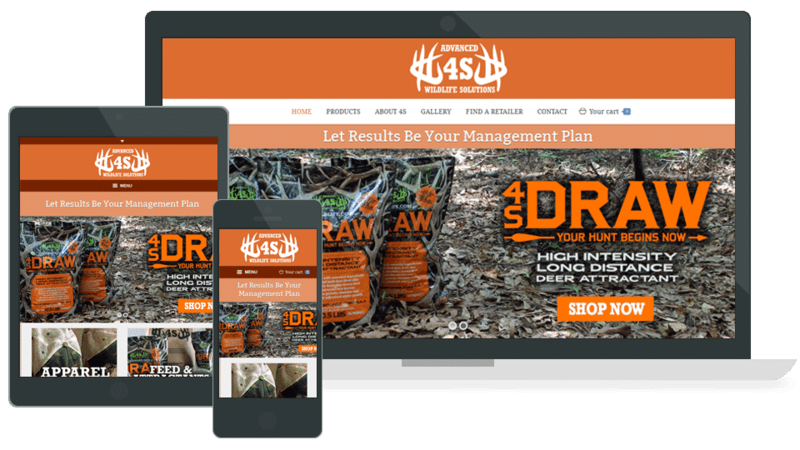 Advanced Wildlife Solution's is another client of Grover Web Design that puts a fanatical amount of time and effort into making sure their customers get the best experience possible online. AWS is based out of Reynolds, Georgia and sells premium deer feed and attractants throughout the country. Watch the website overview video to see the website and its various capabilities. So, I bet you did not notice the error in the tablet and mobile view above, check out the main slider it's falling off the page! We have obviously fixed this for this site, but I wanted to point it out while I was talking about the homepage slider. AWS has their own graphic designer so they have the ability to get high resolution images and can create some of the awesome designs you see in their home slider. So, to support this creativity we had to take our normal slider revolution implementation to the next level. Traditionally, sliders are created in a way that they have a simple design and can scale down to mobile. This method sometimes doesn't affect clients because they keep it simple. AWS wanted to get a little more creative and have two versions of the slider, simple for mobile and a little more advanced for desktop. We made this possible by creating 2 slider revolution sets and targeted devices to decide which one to show. It has been great and really allows AWS to be creative in their design! Checkout the "Find a Retailer" page on the AWS website, they have over 350 retailers! This is a tool that AWS uses all the time to manage their ever growing list of retailers. Since they use it all the time, GWD made sure that it's easy to manage the retailers and does not require any special programming knowledge to do so. The most important aspects of websites sometimes have nothing to do with the front end look of it. This retailer map is a perfect example, the client does not have to email us and ask us to make the changes. They don't have to have a computer whiz sitting there ready to add retailers. It's just like all Grover Web Design tools easy to use and manage by non-technicals! Up until a few months ago, Advanced Wildlife Solutions has not invested too much time and effort into online marketing. Their website was mostly just an extension of their brick and mortar business. But, they wanted to step up their online exposure, so Grover Web Design was there. We implemented a Google AdWords campaign that focused on some of their target geographical areas and promoted some of the key products of the current season. The results have been great! 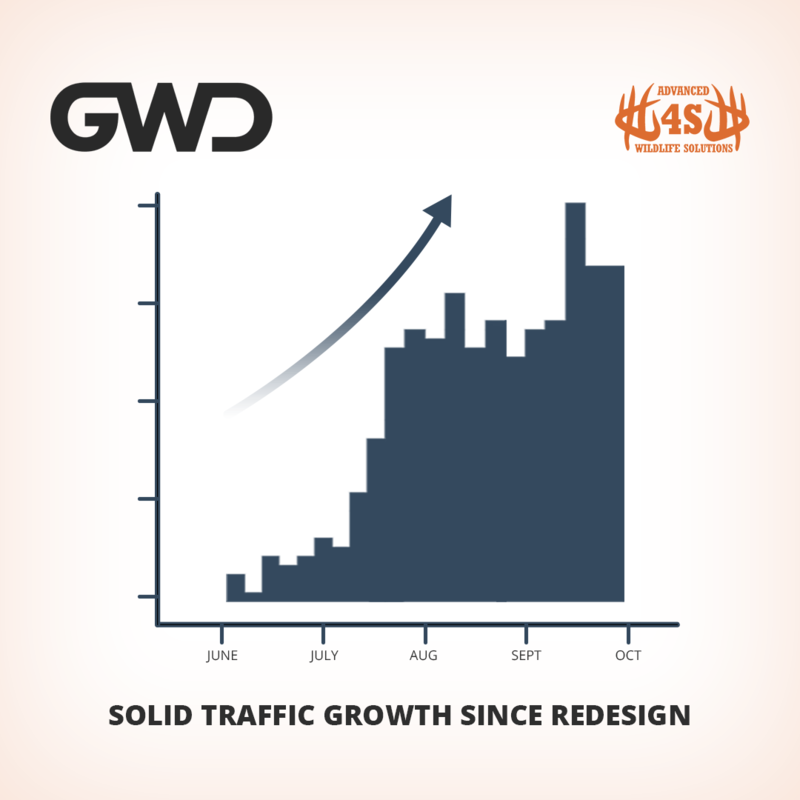 We couple a smart AdWords campaign with solid organic growth to product these types of results! Yes, the AdWords campaign is great, but more importantly is the organic results. 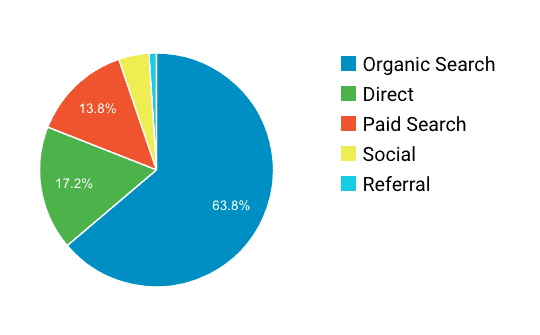 We are getting 63.8% from organic searches. This is basically free advertising for their company because the majority of visitors are finding the website through search instead of ads.